Our Scamper Terralift® aeration machine was developed from the original Airforce Terralift® enabling our operators greater versatility, less weight and an efficient braking system for negotiating difficult terrain. 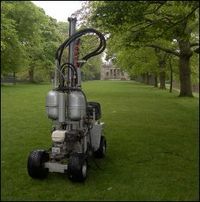 Unlike Airforce the Scamper tows the compressor making the machinery much lighter per square inch on the turf surface. Scamper was first introduced in 2003 at the Saltex show and very quickly put to service decompacting the grass areas of the show ground and still remains the most active of the Airforce Terralift® machines in the Terralift® fleet.